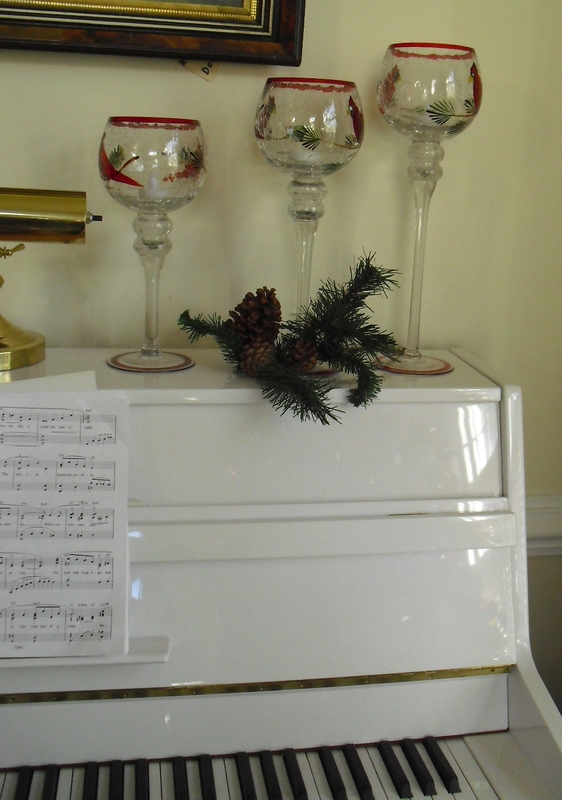 ENTERTAINING DURING THE HOLIDAYS can be stressful, but it need not be so. Entertaining can be as simple, or as complicated, as you want to make it. Let’s have some lunch in my kitchen and then talk about it. We hang bells on the outside doors in December so we can enjoy the tinkle of bells as we go in and out. The children love it – and so do I. THE FOCUS IN OUR HOUSE IS ON CHRISTMAS, as our family’s tradition dictates, but perhaps a few suggestions may be helpful to bloggers who are preparing other holiday celebrations. I AM NO MARTHA S., nor do I aspire to be an entertaining diva. I have always wanted our home to be a place where family and friends felt welcome, when they visited. I’ve had a number of years for trial and error and have arrived at my own ways to make entertaining more enjoyable for me – and hopefully more memorable for my guests. (One of the many perks of getting older is all that comes with life experience.) If the host is relaxed and having a good time, our guests’ pleasure in being in our homes is multiplied tenfold. Yes, I know that is not always possible. There may be a family member or co-worker that is a challenge for you, but should be included in some traditional event – so onward. We do our best to be gracious and make guests feel welcome in our home. Aside from the have-to-have folks for obligatory events, this is a wonderful time of year to plan special events in your home with people you enjoy to share your decorations, traditions and holiday foods (e.g., lunch, dinner, coffee, tree decorating, cookie exchanges, dessert sampling, wine and cheese by the fire). This is the time for joyful celebrations – large and small. As a young wife and mother, when I was trying to master so many things at once in managing a home, I set such a challenge for myself for entertaining that I was often exhausted when I met our guests at the door. My sister often kids me about the dinner I fixed that used every pan and dish in the kitchen. I even made a dobosh torte with 8 different fillings. No more! Unless you enjoy many hours in the kitchen, are catering the event, are working on a cookbook, or have good helpers, you may want to plan a gracious and fabulous repast that won’t burn out the chef. THIS IS MY RECIPE now for entertaining, especially for dinner parties – the 1-2, 3 & 3 method. This Star-Early Bird and Easy Method is based on the notion that not every dish I serve needs to be a candidate for gourmet magazine, a never before seen dish or take 2 days to prepare. Oh. What a relief! I use this method for planning the menu. 1-2 STAR DISHES Star dishes are 1 or 2 complicated show-off gourmet dishes. They can be the entrée, dessert, bread, or some of the sides. There are the stars of the meal.! The other dishes are delicious also, but are supporting players in your meal. 3 EARLY BIRD DISHES These dishes can be prepared a day ahead with minimal preparation the day of the event. 3 EASY DISHES These are prepared just like the name sounds – easy, (e.g., purchasing a unique side dish or bread from a deli or restaurant ready to bake or warm, or a dish you can prepare with few ingredients – or in little time). WE DECORATE THE CHRISTMAS TREE the day after Thanksgiving and finish the other decorations by the first week of December. So – that is done and ready to enjoy the festive display while we move on to holiday activities. The house is always ready for entertaining, with a just a few things to do to refresh the decorations before each event. I LOVE HAVING FRESH plants and flowers around all year long. I usually find something to cut from the yard and add to that with fresh flowers picked up at the grocery. This can be an arrangement on the serving table, in the living or family room, or even a small vase with one flower on the table. I always put a fresh flower in a bud vase in the guest room. It says welcome in a special way. MOST CHRISTMAS TREE LOTS will give away, or charge a small fee, for armloads of pine or frazer fir branches they have cut away from the trees in shaping. I put the branches in a bucket of water and keep outside where it is cool. 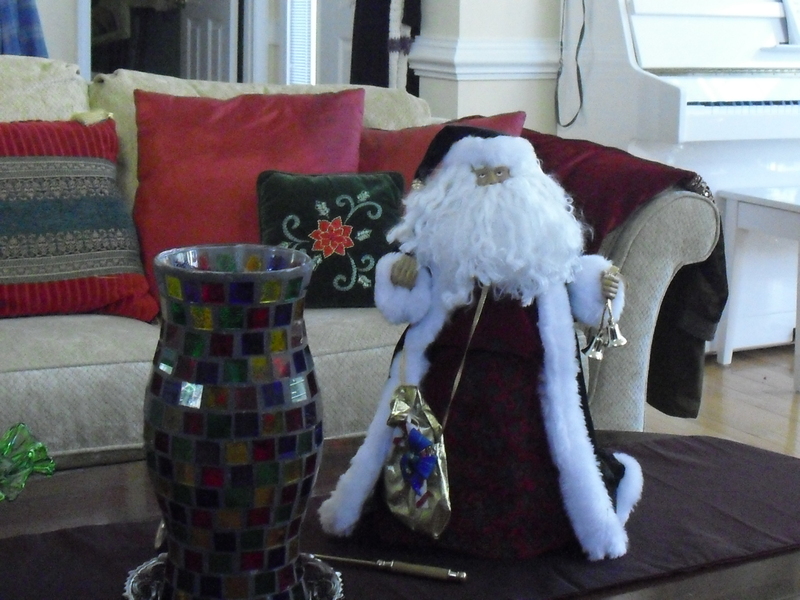 Weekly, I bring in fresh boughs to add to the mantle and table decorations and toss the old ones. The fresh greens add a Christmasy scent to the room. CANDLES CREATE a special atmosphere in the evening. I have candles in my kitchen, in the living room and on the dining tables. To simplify my life, I have given away all candle holders that hold the tapers that have to be monitored for fire and for dripping wax. I only use fat candles inside hurricanes and I also have a few battery candles that come on for 5 hours in bedrooms or places where children gather. 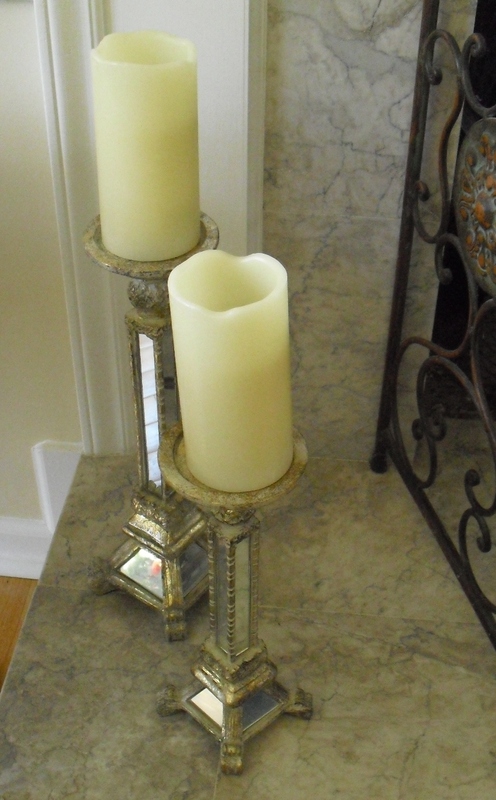 Battery candles near the fireplace turn on automatically for 6 hours after dark. I DON’T MEAN TO GO CRAZY in over-the-top decorating. No, I mean to at least put a touch of the holidays in the room you spend a lot of time in – your kitchen. It can be as simple as one Christmas candle, a wreath on the kitchen door or a small kitchen tree hung with cookie cutters. I have a favorite red apron I wear in December and I use a couple of Christmasy pot holders and dish towels. THINK OF IT as creating a stage to present your food as the star. Decorations can be simple, with candles, flowers, pine, or just scattered ornaments or pine cones. WE LEARN THE LESSON early (at least many women do) that we project a more confident and relaxed manner when we wear something we feel comfortable in.. and that we think we look good wearing. So – think about what you are going to wear ahead of time, so it is ready to wear. Plan your time so you can take a leisurely bath or have plenty of time to dress before guests arrive. Congratulate yourself on your preparations. You deserve it. Greet your guests at the door with a smile. Enjoy your guests and your own holiday party. 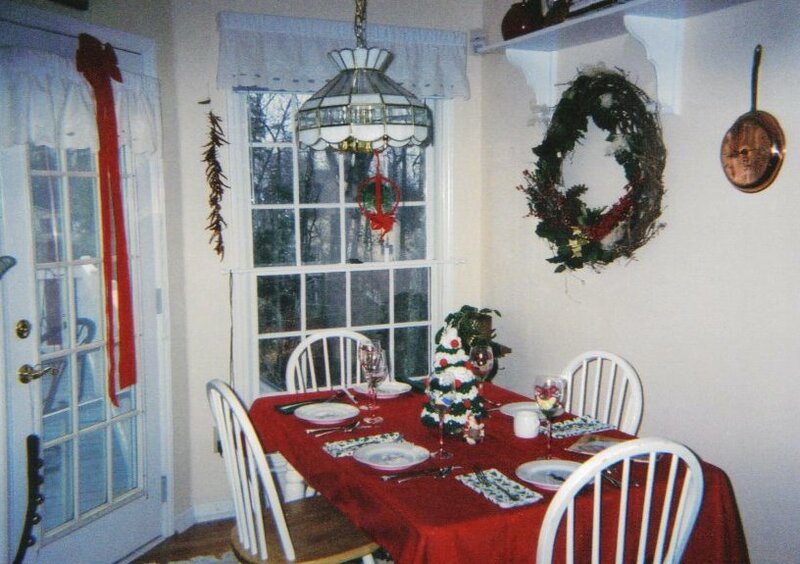 Sue – You have wonderful suggestions for the holidays and your decorations are stunning. Each photo shows a warm and inviting room. Merry Christmas and a Happy New Year. Great tips Sue! The best advice is to keep it simple so you can enjoy the party too. Your home looks so cozy! It takes time, but we finally learn. Thank you for your wonderful suggestions. I used to make myself nuts preparing complicated dishes. Now I use my crock pot and serve extra special desserts and homemade Focaccia. Very sage advice! We all learn the hard way about ehausting ourselves in the cause of making a big impression! I love your food star rankings, very sensible! Freshly cut trees only last about a week in our heat, sadly!